You may face a log repair job when all your efforts to preserve the logs in your cabin have failed and you’re left with a rotten log. Don’t despair – you’re not the first and many techniques have been worked out to deal with various log damage issues. You can check if a log is rotten by shoving an ice pick into the wood. If it penetrates and easily slides in, you’ve got rot. Rot occurs when the moisture content of the wood is between 30%-60% so you first must address this problem. Although it may be too late at this point, it’s a good idea to review the causes of log damage so you can understand what led to the deterioration of your log home. More importantly, it will illustrate what needs to be done to prevent further damage and another log repair in the future. You need to address these issues before attempting any log repair or it will simply happen all over again. 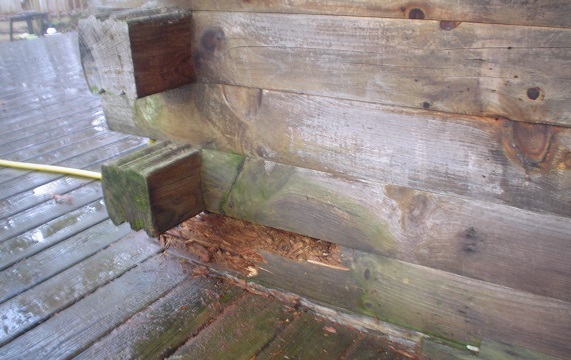 We cover some of the causes of log damage in our page on log cabin restoration. It also may help to review some of the common terms you will encounter in our cabin restoration glossary page. 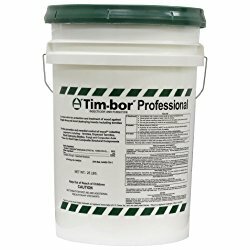 You can help prevent future log damage by using a water-soluble borate compound that is legal for use in the US, such as Tim-bor. This will slowly seep into the wood and prevent future rot and insect damage but it must be done before any epoxy or other wood restorative is used so that it has a chance to penetrate the wood. Borates are water-soluble, inorganic borate salts with insecticidal and fungicidal properties that are effective against many wood-destroying organisms. Saturate the wood by brushing or spraying on the borate. If the wood is very spongy you can also inject the solution into the wood. The first thing to try with log repair is log restoration. This is a process that can strengthen the existing log and even replace the deteriorated wood cells with epoxy so that you can leave the log in place and continue to use it and depend on its structural integrity. There are two epoxy-type products that can help you repair and restore logs. The first is a 2-part epoxy product called Liquid Wood. It is a deep-penetrating wood consolidant that restores structural strength and durability to wood fibers. 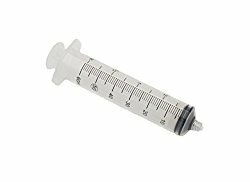 To strengthen spongy areas of the wood you can drill small holes deep into the wood and inject Liquid Wood using a large, 60ml syringe. The solution surrounds the wood cells and solidifies them, maintaining the wood structure but making it rock hard. If necessary for deeper penetration you can dilute the epoxy with acetone (up to about 10%-15% acetone) but be aware that you are sacrificing some of the strength. Paint the cured epoxy with a tan color before staining it to match the rest of the cabin. The next step in treating log damage is to repair the log. Sometimes it is possible to chisel away the rotten section and treat the area with wood filler. One method is to mix up a thick paste using sawdust and waterproof glue. Unfortunately, this doesn’t last very long, and won’t blend very well. You may also try cutting away the rotten part until you get to solid wood, then use a “Dutchman” or filler piece, cut to match the sction of wood removed. Once you’ve cut away the damaged section you can insert another, shaped piece of wood that is glued and fastened into the area, then blended with stain and finish to hide it. The final step when all else fails is to replace the entire log or section of log that is rotten. This is a job best left to professionals but any log replacement would include several common steps. One of the most susceptible parts of the log cabin is often the log ends that extend beyond the shelter of the roof. You can cut the rotten log end off and replace just the corner extension with a short piece shaped like the log end. Attach it to the existing corner by screwing upwards at an angle into the logs above. You may also attach it to the log end by countersinking several log screws, then plugging the countersunk holes with matching wood. Typically the bottom logs, or sill logs, on the cabin are the ones that rot. These are exposed to water from splashback, poor landscaping and leaky or non-existent gutters and generally incur the most damage from rot. Replacing entire logs involves supporting the remaining logs above the rotten log. This may involve cutting a slot in the rotten log and inserting a wooden beam or steel plate that can be supported on both sides of the wall. Adding a hydraulic jack under one side allows you to take the weight of the log wall above the damaged log by jacking up very slightly. 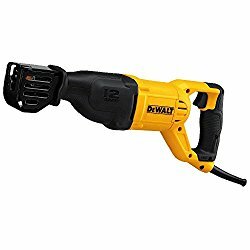 This will support the wall while you remove the rotten part. Next you can cut away the rotten log using a reciprocating saw and chisels, being especially careful to use a metal-cutting blade to cut the log fasteners holding it in position. Log fasteners may be log screws, wooden pins, threaded rod or nails. Cut, scribe and insert the new log into position, removing tongues as necessary to fit it in place. Careful use of caulk, chinking and fasteners will result in a replacement you can hardly see. Use a log style and species that will closely match the existing logs. Countersink and plug holes for log screws. I recommend you use a 1" forstner bit for a clean, flat countersink hole, then plug the hole with a section of 1" dowel. These techniques can help you address the problems of log damage, rotten logs, log repair and log replacement. Oftentimes a combination of all of these may be called for. Be sure to address the underlying causes and correct these before attempting any repair or you will be facing another log repair job in the future.